When you are abroad you hope you do not get ill, but if you do these ESL doctors conversations could help. They will show you the sort of speaking that you will need to do when booking an appointment or seeing the doctor. These conversations complement the ESL doctors vocabulary. You can use the vocabulary list to look up the definitions of any of the words you do not know. Filling in the blanks with the correct phrase in a conversation. Conversation topics so you can have a conversation with a friend. Situation: Jane is unwell and visits the doctor. Jane:	I feel unwell and keep vomiting all the time. Doctor:	How long have you felt like this? Jane:	Nearly two days. It started just before going to bed the day before yesterday. Doctor:	Let me examine you. I will press on your stomach to see if it hurts and then listen to your heart. Jane:	Ok. It doesn’t hurt when you press my stomach. I just feel tired. Doctor:	Ok. Did you eat anything different from usual before you started to feel this way? Jane:	Yes my boyfriend cooked dinner for me. He isn’t a very good cook and the food tasked a bit strange. Doctor:	You’ve got food poisoning. It is not very serious and you should be better in another day. Jane:	Oh dear, what should I do. Doctor:	You need to drink lots of water and get plenty of rest. Jane:	Ok, thank you doctor. Doctor:	You’re welcome. If you are not better in 48 hours come and see me again. Situation: Andrew does not have an appointment and needs to see the doctor urgently. Andrew:	Cough, cough. I’d like to see the doctor please. Receptionist:	Do you have an appointment and what’s your name? Andrew:	No I don’t have an appointment. My name is Andrew Jones. I’m registered as a patient of Doctor Crow. Receptionist:	Doctor Crow is making house calls all morning and all the other doctors have a full schedule of appointments all morning. Make an appointment and come back tomorrow. Andrew:	Surely there must be something today. I really am very ill. I feel awful. Receptionist:	Someone might cancel an appointment. You can sit and wait if you want to. Receptionist:	Mr. Jones, the doctor will see you now. Please go to consulting room number 3. Doctor:	Good morning Mr. Jones. What is wrong? Andrew:	Morning. I feel very ill. I am coughing and sneezing, I have feel hot and cold all the time and eating makes me feel sick. Doctor:	Let me take your temperature. How long have you had the symptoms? Andrew:	They started about a day ago. Doctor:	Yes your temperature is very high. You have the flu. You’ll have to go home and stay in bed until it gets better. Drink lots of water. Andrew:	Can you give me some medicine? Doctor:	I can give you something to reduce your fever but you just need to get bed rest. I will write you a prescription and you can collect the medicine from the pharmacy. 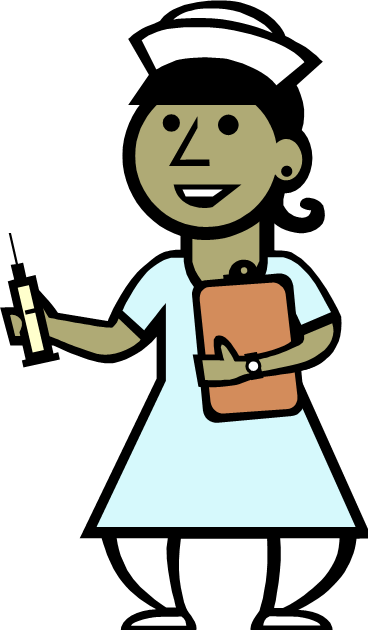 Once you have read and watched the above esl doctors conversations and learnt the conversation vocabulary you can do the three following exercises for practice. Fill-in the blanks in the following conversation using the options provided in the 5 question below. Lucy:	Yes I do. My name is Lucy Smith and my appointment is at 10.30 am. Receptionist:	Yes, thank you. _________ (2) _________ and the GP will see you as soon as she is free. Doctor:	Good morning Ms. Smith. I have your test results here. Lucy:	Good. I hope that everything is alright. Doctor:	Yes everything is ok. There are no major problems. I would suggest that you try not to eat too much food with a lot of cholesterol in it. Lucy:	Oh dear. Is my cholesterol level too high? Doctor:	It is quite high and you should try to stop it getting any higher. Lucy:	Ok. _________ (4) _________ to help reduce the cholesterol?Doctor:	No. It isn’t too high so it would be better for you to lead a healthier lifestyle rather than take medicine. Lucy:	Ok doctor I will try. Doctor:	Ok that will be good. Choose the best option (A-D) in the following five questions to fill in the blanks in the doctors conversation given above. C) please go to consulting room one. Now try to write an esl doctors conversation yourself. This should be between two or three people and be related to visiting a doctor. 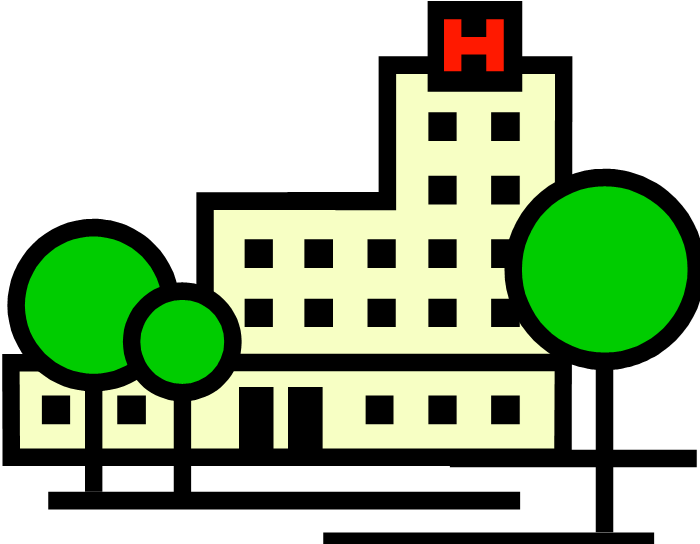 A couple of ideas could be a patient visiting a pharmacy to get their prescription or a mother taking her son or daughter to see the doctor. 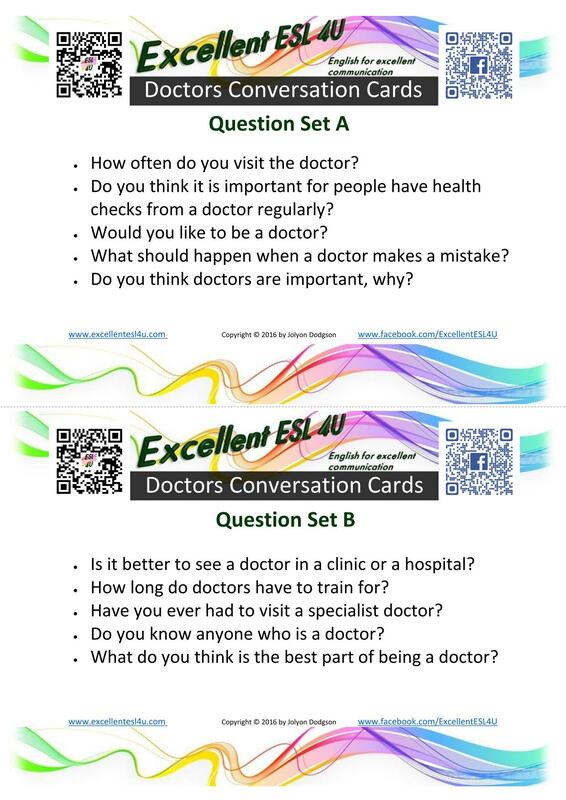 Below you have two sets of esl doctors conversation questions. With a friend discuss the topics. One person should have set of questions A and the other set B. Try to give long answers and use as much of the vocabulary you have learnt as possible. Do you think it is important for people have health checks from a doctor regularly? Would you like to be a doctor? What should happen when a doctor makes a mistake? Do you think doctors are important, why? Is it better to see a doctor in a clinic or a hospital? How long do doctors have to train for? Have you ever had to visit a specialist doctor? Do you know anyone who is a doctor? What do you think is the best part of being a doctor?